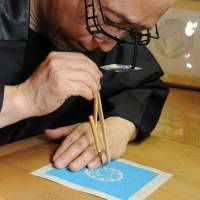 Today, at least 20,000 family crests are on record, though if others in use were to be included, the total would become many multiples of that, explains Hatoba, the third-generation owner of Kyogen, a family-crest business founded in 1910. 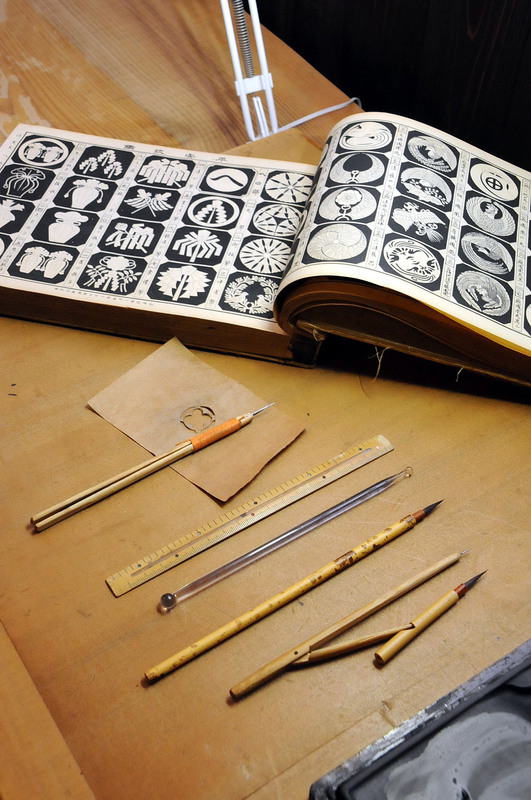 The crests’ motifs are derived from a wide range of plants, birds and other animals. For example, designs featuring omodaka (arrowhead), a perennial freshwater plant with leaves shaped like the business end of an arrow, were favored by warriors who believed they would bring them victories. Dragonflies, too, were popular for the same reason, being considered a “winning insect” as they never retreat, Hatoba explained. 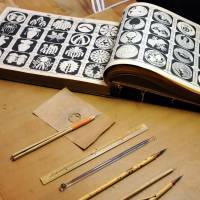 Sadly, despite such rich traditions, the trade of designing and painting crests is on the decline. 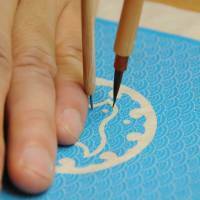 Many Japanese — even those who wear kimono today — pay little attention to their forebears’ family emblems, he says. 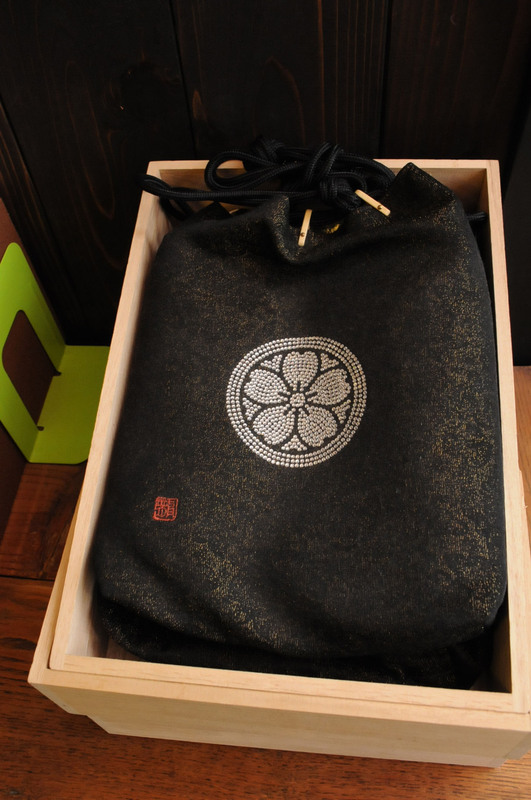 One example of his recent handiwork is a silk pouch-style bag adorned with a family crest in Swarovski crystals. 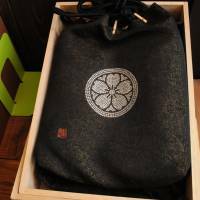 After creating a design for the crest on his computer, he then manually glued each stone onto the bag. 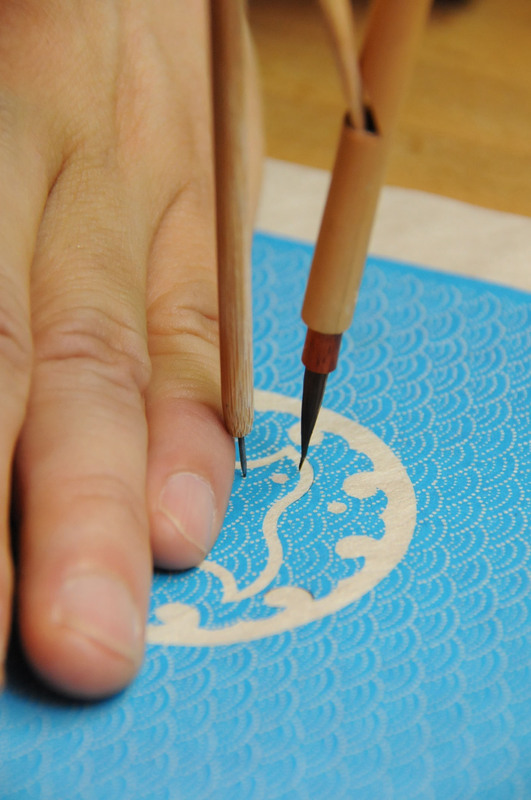 Another of his ideas is to turn the crests into artworks to be framed and displayed like paintings — by featuring them against a background of Edo komon patterns, which are often seen on textiles and characterized by small dots and repetitious tiny motifs. Most recently, a think tank affiliated with the Itochu Corp. trading house asked him to design five embossed kamon designs for white paper boxes containing five “futuristic wagashi” each, to be handed out at a party the think tank held earlier this month. In line with the concept for the sweets to be served at five different times of the day, he designed each crest to reflect the time-counting system during the Edo Period, when a day was divided into 12, with the first six marking the hours from dawn to sunset, and the second six from sunset to dawn. For example, at dawn people learned the time from listening to the bell in a community being rung six times in a row, so he divided the circle into six, and featured six equal-size leaves of the mallow plant inside it. For the day’s third sweet, to be served around 3 p.m. — when a bell would have been rung eight times — he drew a design of eight bunches of wisteria in a circle. 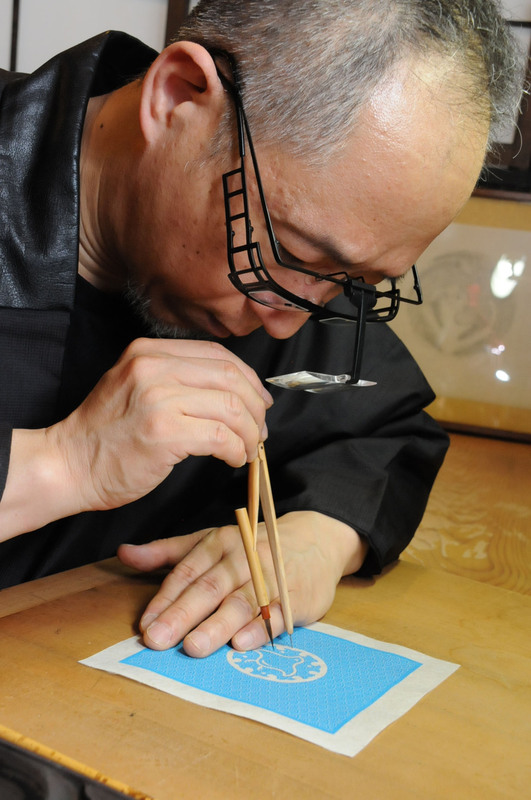 Hatoba will show and sell his kamon works at a craftsmanship fair in the 7th-floor event hall of the Mitsukoshi Department store in Nihonbashi, Tokyo, from June 25 through July 2. Some of his other new works, including furniture and pottery, will also be on sale. 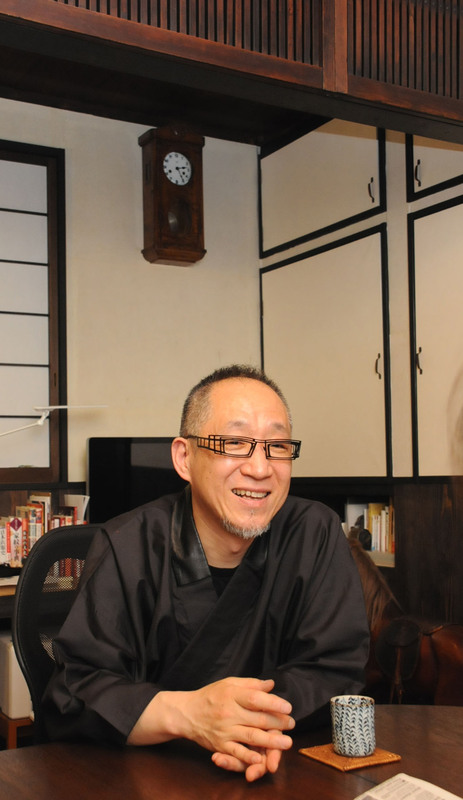 For more information, visit his website at www.kyo-gen.com.